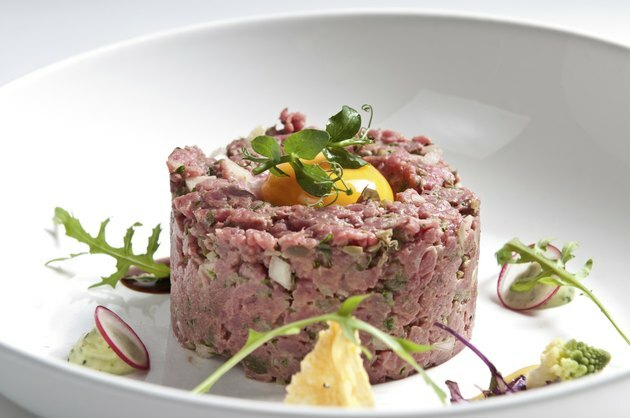 When high-end restaurants serve beef tartare to diners, they have to slice it thin or serve it ground so people can chew it. At the same time they serve the raw meat, they also warn their customers about the dangers of eating it. If you are like most diners, you heed the warnings and avoid raw meat. Your choice might be based on concerns about safety, or you might just want the satisfying taste of cooked meat. Sharp claws, long, sharp teeth, jaws that move only up and down and a large mouth relative to the head enable carnivores to tear off pieces of raw meat from their prey. On the other hand, humans have soft fingernails, flat teeth and jaws that move side-to-side. Human teeth can't tear flesh from the bone, and their fingernails can't tear raw meat. Human teeth are bad at breaking up raw meat, but good at grinding foods with lots of fiber, such as grains, fruits and vegetables. Carnivores have very strong stomach juices, capable of breaking down the protein in raw meat and minimizing the effect of bacteria and parasites often found in raw meat. Their stomachs hold large amounts of meat, and their intestines are much shorter than human intestines, shortening the time that any dangerous bacteria linger in their digestive systems. In contrast, human stomach acids are much milder. Moreover, humans rely on saliva in the mouth and in the large and small intestines to help with digestion over a longer period of time. Cooking meat begins to break down its protein, allowing humans to gain more energy and nutrition, according to Richard Wrangham, author of "Catching Fire: How Cooking Made Us Human." Cooking kills the bacteria and parasites in raw meat that are likely to make you sick or even kill you. Early humans might not have known the names for E. coli bacteria, salmonella, trichinellosis or brucellosis, but they could see the effects that occurred after eating raw meat, such as severe cramps, diarrhea, bloody stools, fever and vomiting. If it weren't enough that raw meat is difficult to digest and can make you sick, it also has less taste than cooked meat. Humans, as well as other animals, respond to the smell of cooked meat. In fact, close to 600 components make up the aromas for beef, according to the Science of Cooking website. When meat is heated, its sugars and proteins combine and cause meat to brown and gain flavor. How Hard Is It to Digest Beef?